Sometimes, after taking a shot, particularly if there are strong light sources, you may notice some weird light spots on your photo. Most certainly, they were caused by lens flare. But what is lens flare anyway? 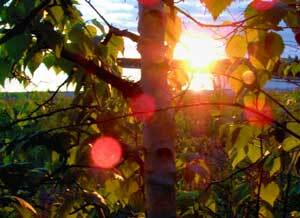 To understand lens flare you need to know how light works in photography. Basically, everything reflects light. You see an object as it is because it absorbs some light wavelengths and reflects others. Similarly to the human eye, a camera records the light reflected from objects and that reaches the sensor. In a perfect situation only your photography subject should reflect light directly into the front element of your lens. But this never happens and everything that surrounds your camera is reflecting some light and some of it will indirectly enter your lens. 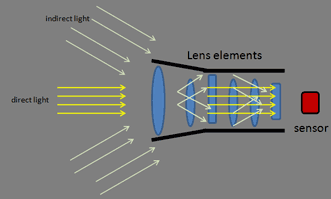 Lens flare is thus caused by indirect reflected light entering your lens and being scattered around your lens elements (bouncing inside your lens) until it reaches the sensor, as shown in the schematics bellow. 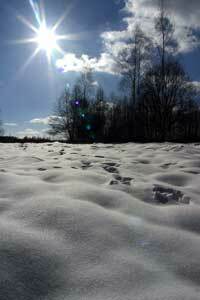 On normal conditions, the direct light is stronger than the indirect one and lens flare will be minimal and hardly noticeable. 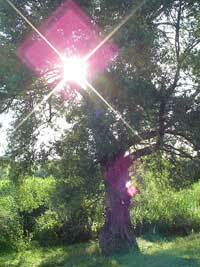 Problems arise when the indirect light comes from a strong source (like the sun). If it’s strong enough you’ll see those flare artifacts. Even when flare is not strong enough to produce artifacts, light can be broadly distributed all over the photo, reducing contrast and turning the photo pale. On a more extreme situation, lens flare can create all sorts of weird aberrations and destroy the photo completely. Although lens manufacturers use special coatings on the lenses (particular on the front element) to reduce light reflection and scattering while allowing light refraction, it’s impossible to eliminate it completely (light has to go through anyway). The more glass elements your lens contains, the more pronounced lens flare will be as more surfaces are available to scatter light around. Therefore, lenses with a wide range of focal lengths are particularly affected as more elements are needed. Of course that, when used correctly, this property can be applied for the photographer’s advantage. Lens flare can give a special kind of drama to the photos and in fact there are many filters out there (physical as well as software) that intend to mimic lens flare to introduce flare effects on the photos. The best way to reduce lens flare is by minimizing the amount of indirect light entering your lens. This is usually accomplished by shading the front element on all it’s sides with the use of a lens hood (those bulky nasty things have a use after all). Lens hoods, their design and how they work are also complex matters and will have a post of their own in the next days. Meanwhile, keep this in mind: Whenever possible, use the hood.